Today is Earth Day. The 40th anniversary of Earth Day. While I think we should pay attention to what are going to the planet every day I think that having a day to bring about even more awareness is a great thing. So take the time today to think about what you are doing to change your impact on the planet. Are you using reusable bags at the grocery store? How much recycling do you do? If possible, do you take public transportation to work? Are you eating locally? Are you growing your own veggies? Do you use reusable water bottles? The real thing that shocked me was seeing the above poster that someone posted at work. This was a pull out from the National Geographic magazine. 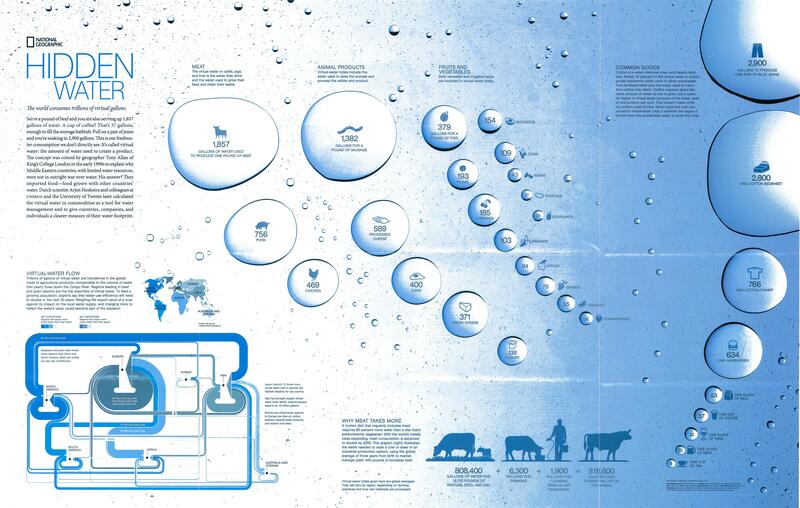 The poster tells the tale of the water that is hidden in the food you eat and products you use. Did you know that it takes approximately 1,799 gallons of water to produce 1 pound of beef? Kinda crazy, right? You daily cup of joe in the morning has 37 gallons of water embedded. The one that shocked me the most was that 1 pound of chocolate has 3,170 embedded gallons of water. Wow, I’ll going to look at chocolate chip cookies differently now. Now I’m not saying that I am going to change my life upside down and become a vegan. I think it is great that people have the passion to stick to that diet but it’s not something I can stick to. I love cheese just far too much. But I know that I can cut back on my beef intake. I think taking a few minutes today to think about your impact will open up your eyes and you will learn just how of an impact you are leaving behind. Go to the National Geographic site to look at more information and see how things compare.